The long-awaited sequel to Just Cause 2 finally arrives with a more beautiful sandbox for destruction and better tools with which to cause chaos. After the success of Just Cause 2, Avalanche took their time to make a sequel as they waited for the next-generation consoles to arrive and offer a more powerful base with which to build their destruction tech upon. In fact, they created a completely new studio in New York for Just Cause 3 while the original team in Sweden worked on the recent Mad Max game for Warner Brothers. The developers hired for this studio were required to have a love of Just Cause 2 and it shows in the results. 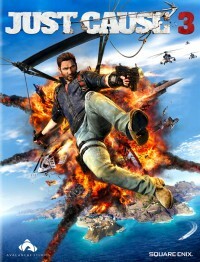 Just Cause 3 is a more focused form of Just Cause 2 with the large map having much less filler content than the last game as the story and challenges gain more of a prominent role over the sandbox content. 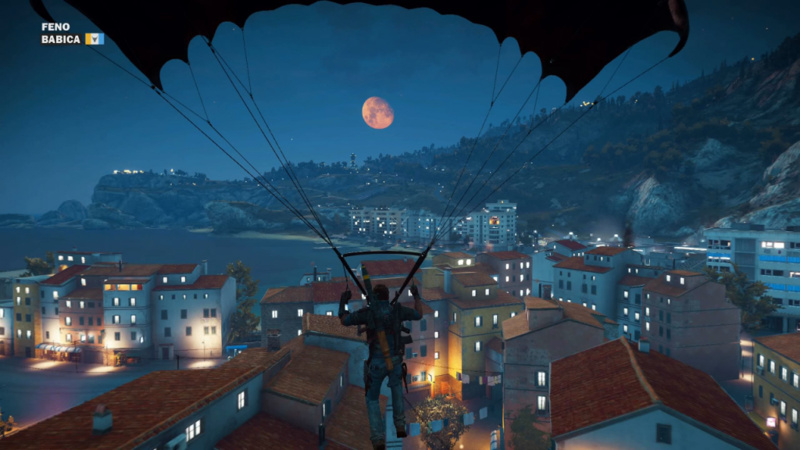 Just Cause 3 is set on the Mediterranean island of Medici, as an older Rico Rodriguez is sent to his homeland to free them from the brutal rule of General Sebastiano Di Ravello. The story is a cookie cutter plot that plays out exactly as you’d expect with no surprises. The one emotional moment that they attempt falls flat because you’ve never been given a reason to get emotionally invested in this character. There are too many silly moments where characters like Mario Frigo tell you to not worry about what you destroy because they can easily rebuild the damage while later tricking Rico into kissing a cow to let any serious story beats ever have any impact. 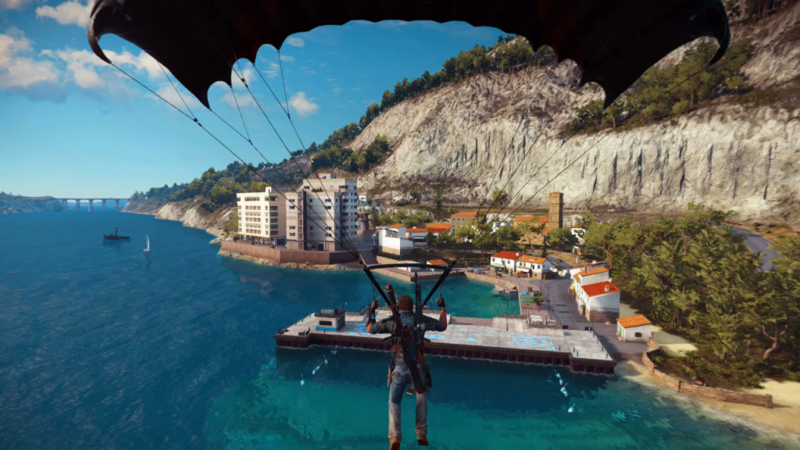 Just Cause 3 makes some marked improvements in how you get around the island and the weapons you can use to liberate the towns and bases that are scattered around Medici. The biggest addition is the wingsuit that offers a faster way to get around once you get the hang of how it controls, which forces the parachute to be a slower option meant to give you an easier time to coordinate to attack bases and enemies from the air. Vehicles are much better to control this time around as the talents of the new team have allowed them to make driving more of a viable option for traversal in the missions and such that require them. Though, the wingsuit and parachute are much better for most things in the game. Compared to the last game, Just Cause 3 has made some big changes when it comes to how you earn new weapons, vehicles, and upgrades for various parts of the game. Gone are Just Cause 2’s overall Chaos meter unlocks where you just liberated villages and bases, blew stuff up, and accrued Chaos as a currency or XP that lead to blackmarket items and missions unlocking along the way. Instead, you just liberate villages and bases and a suite of unlocks occur with each of them from specific weapons and vehicles added to your Rebel Drop options and challenge missions that help you unlock “mods” to upgrade specific parts of the game. These challenges provide the most direct way to customize how you play the game and tailor your abilities to your taste, which a neat way of letting players unlock some of the crazier aspects of the game despite this method making the desire to unlock everything an exercise in tedium. As much as I’m excited to go back in and liberate the last few areas and find the last few collectibles that I missed, it’s the randomly long loading times for some of those challenges that makes me less excited to try to unlock whatever is left. The more simple challenges involving racing vehicles or the wingsuit load very quickly, but those involving destruction where they have to rebuild bases I’ve “liberated” to their original state can take nearly three minutes to load, one minute if I need to retry for higher scores, and about two minutes just to get back to the world, which creates some apathy in me when the thought of trying to max out every challenge that appears before me. To add to those loading time woes, Just Cause 3 has major performance issues on consoles and I can confirm specifically with my experience on the PS4 version. The biggest of its issues are the crashes, as I experienced six during my 25 hours in the game, with none more devastating than beating a big story mission and having it crash during the rewards screen. This is where I learned that they don’t save your mission completion until you’ve clicked through all of the rewards. The story missions are easy and not that big of a hassle, but it’s still annoying to be technically done with a mission and have to start over because it crashed right before it could confirm that I beat it. Framerate issues plague much of the destruction I caused throughout my time with the game, which never feels like a satisfying drop as if you’re pushing the hardware to its limits and instead are just experiencing a poorly optimized game crapping out during its best moments. You won’t even get an appropriate weapon to make these drops feel somewhat satisfying until near the end when you get a Bavarium Nuke launcher that causes a massive explosion, the likes of which I haven’t seen since the foggy days of Nintendo 64 shooters. The framerate issues and crashes soured my experience with Just Cause 3 enough that I may take a break from my original plan of trying to 100% the game until some performance updates are released. I’d suggest you do the same if you’d prefer to play the game at its best and don’t have a suitable PC to power past those issues. To go along with the performance issues, I found the focus on the bland story missions to be a detriment to its potential as a sandbox game like Just Cause 2, where it could’ve taken a page out of the Crackdown book and made it purely about exploring the world, liberating villages and bases, causing some chaos along the way while exploiting the great tools that you have on hand to let you approach the game the way you want. It’s far too easy to use the tether, parachutes, some guns, and your rocket launcher to do 99% of your liberating and story mission work without the need to get creative with the rest of your arsenal. Just Cause 3 is worth playing at some point, but the enthusiasm with which you should do so should be lessened if you’re a big fan of the previous game.